Would you like to have a base set of settings that each slider will use. You can easily do this with the Defaults Addon. Just configure your base settings, click Add New and add your images. It really is that simple! We’ll walk you through each step on configuring your Defaults Addon for Soliloquy. In this instance, you’ll be activating the Soliloquy Defaults Addon. 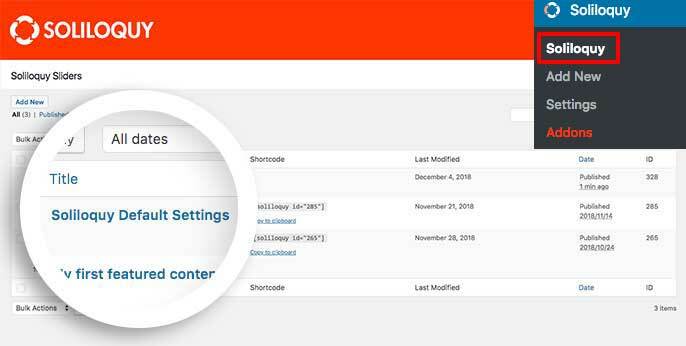 Your first step is to navigate to the WordPress Admin » Soliloquy and selecting the Soliloquy Default Settings to edit the gallery. Your next step is to set up your default settings. The tabs you’ll see will depend on the addons you have installed. Just go through each tab to set up your base settings. Finally, you’ll just need to click Publish or Update on your slider to save any changes you’ve made to your default slider settings. You’re now all set to begin to use the default settings for all sliders. Would you like to see how easy the Dynamic Addon is to use. Check out our tutorial on How to use Soliloquy’s Dynamic Addon. Fixes: Default data reset after deactivation.